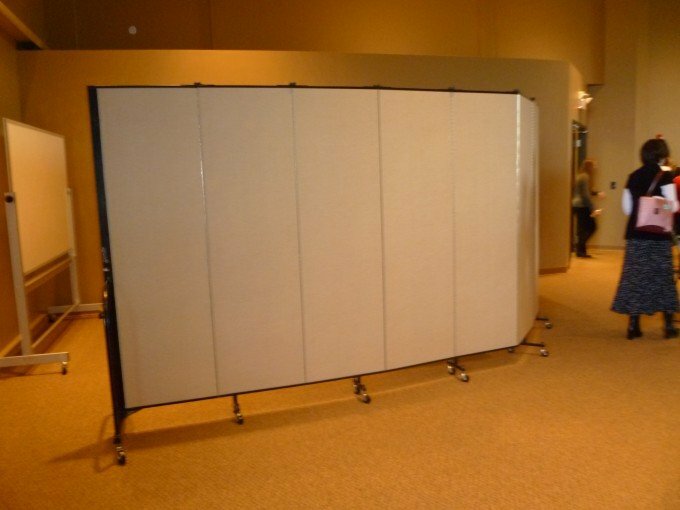 Looking for Room Dividers to create temporary walls in your home, office or classroom? Screenflex Room Dividers set up in seconds and will give you a private, temporary space anywhere you need one. Your room dividers will be a great tool to cut sound and distractions from what’s on the other side! Do you need a quiet, private room, but you don’t have one? Effortlessly roll one Screenflex Room Divider right into place. Open the divider and shape it into an “L”, semi-circle, or a straight wall. You can also connect two or more room dividers together to create several rooms or completely enclose a freestanding room. You have lots of possibilities with these temporary walls. 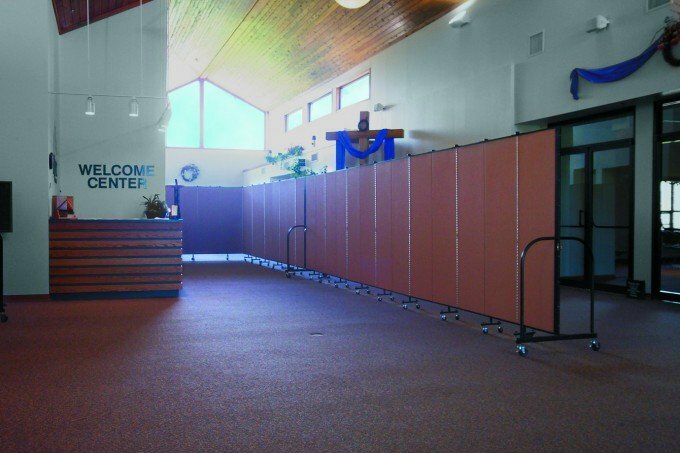 The photo of the church to the right uses 3 room dividers to create a temporary wall for traffic flow. Two sermons run back to back and the dividers help to guide church members in and out of the building. Room dividers create a more organized flow of traffic. One room divider separates two areas and creates a private classroom in the science lab. Room dividers create a visual barrier and sound barrier and help to keep kids focused on their teacher during class time. 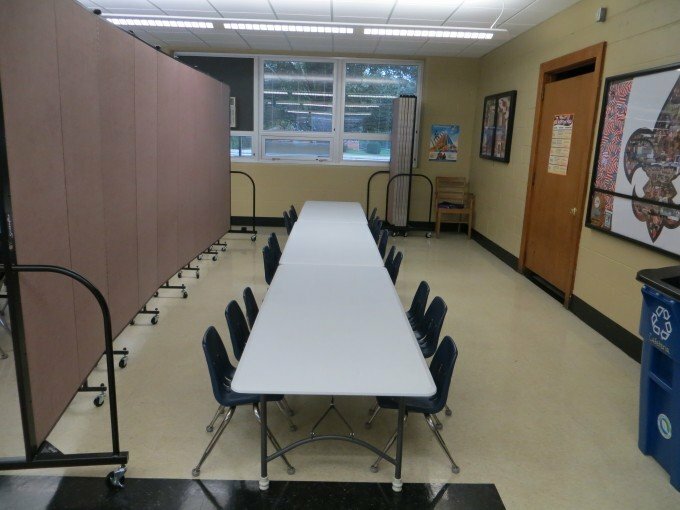 To keep students safe and portable furniture out-of-the-way, University of Illinois uses Screenflex Portable Walls to temporarily store tables and chairs for an upcoming function. Create any size storage space needed with one room divider. All items will be easy to get to. Just fold back the divider panels and access your entire storage space. Create storage or hide junk in any room with a Screenflex Room Divider. Bend dividers to make even odd shapes to conform to the space you have. 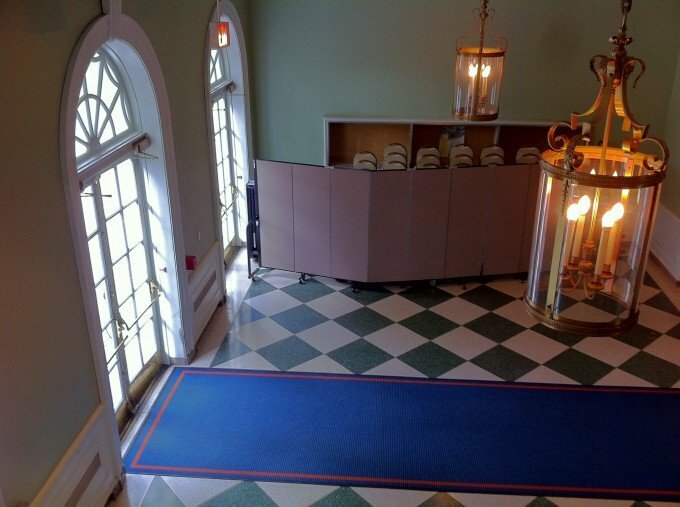 Screenflex Room Dividers are versatile because they are able to be used all over your facility. They can create classrooms, storage areas, temporary walls for crowd control, registration rooms, art displays, information boards, and much more. What will you use Screenflex dividers for in your facility?